As a marketer on Pinterest, you need to know as much as you can about user behavior, including your own. We like tracking four ‘paths’ that flow constantly. Someday there will probably be an analytics tool that helps you track these elegantly, but until then, it’s good enough to just recognize where they are, and track them as you can. 1. Your Recent Activity. Yeah, it’s important to pay attention to what you’re doing. People will watch what you’re doing, so monitoring how your actions are ‘flowing’ is a good practice to be in. Sadly you can only review the last 15 of these actions, then they are lost. Someday a coder will write a program and create a tracking tool to help you keep track of your actions farther back in time, but until then, at least you can see 15. You find this ‘path’ on your profile page, just under your profile description, which is under your picture. 2. Your Followers Recent Activity. Wondering how people are interacting with your content and/or following you or one of your boards? You can track their recent activity on your home-page. Just log into Pinterest, and click the top Pinterest logo to be taken to the ‘logged-in home page’. Notice on the left hand side the section that says, “Recent Activity”. Ah, you’ve found path number 2, your followers recent activity. Notice the ‘source/websitename.com/’. 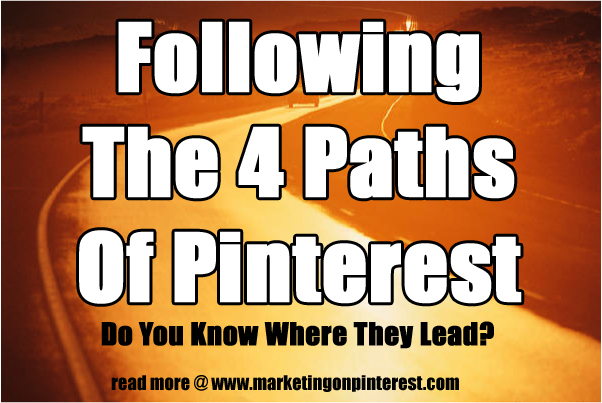 That is a standard structure, so if you’re having trouble finding your way to this path in Pinterest, just copy this URL into your browswer and replace, “marketingonpinterest” with your website name. Sadly, this only shows you TOP LEVEL Pins. When those pins get repinned, it is not shown in the ‘source’ information. In other words. You could have an image pinned one time, and when you ‘source it’ you’ll only see it displayed 1 time. But that image could have been repinned 1 million times. You won’t see those displayed graphically. But you still get a feel for what is happening to your websites content in Pinterest. 4. Your website’s images as they travel throughout the Internet. This path is discovered by using the Google Search Image function. It’s not perfect, but it does a fair job tracking down copies of your images. See a lot of ‘theivery’ going on? Then do a better job of branding on your photos. Include your URL, or Logo. Here is a good tutorial on how to use Google Image Search, step-by-step. And, if you see an image in Pinterest that is NOT attributed to an original website, and/or there is no URL included, you can use Google Image Search to track down the original owner of the image. I hope you decide to follow the four paths!